Conductive plastic element potentiometers offer essentially infinite resolution and longer life than wirewound element potentiometers Too many choices? Through our experience we have designed pots used in light houses (in the UK) , wire winding machines and jet engine test stands. 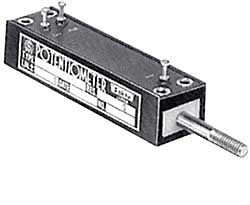 We can help you make an informed potentiometer decision. Call toll free 800-523-3561, 610-359-1002, fax 610-353-1674 or email fast quotes. Options: Sealed body ",O" ring shaft seal, center tap, wire leads.